lesliekeating: oh, eight. oh, nine. i have so much to write about from these last few weeks, wonderful presents and swaps given and received, thrift and antique shop scores, the little bits of sewing i've started on in spare moments and the projects i want to complete this new year. i don't even know where to begin sharing it all... actually, i do. with some photos, that would be a good first step. today's mission: photos. happy new year all, it's so nice to be back. oh my, mae is delightful! old and even then it was only once in a while. now, she is the bestest sleeper ever! well maybe not ever, but good. really good. sigh. I can't believe she is growing up so quickly!! She is beautiful. Well done you. you have been missed~ lovely to see the two of you in the sunshine. welcome back. and happy new year to both of you!! She looks so much like her Mumma - just gorgeous photo and I love the fluffy child isn't missing out on anything either in the back ground. happy new year to you! sounds like you have had a great start to '09 - I'm looking forward to those phots. Goodness she's grown, where does the time go. Your hair looks so much longer now too! Hello, such a lovely photo. I hope Mae liked her egg cup. Looking forward to the photos. 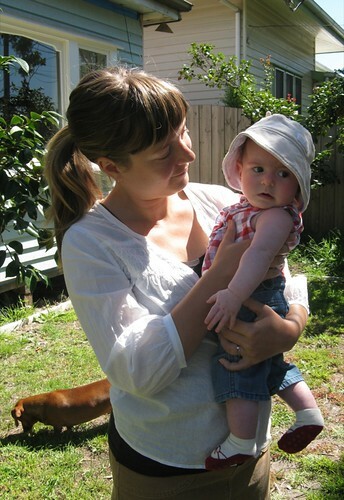 i look at this photo and it takes me back 6 years to when I was living in Melbourne, with our dachshund and son at a similar age. time has gone so quickly. enjoy the tickles and giggles, even though sleepless nights can get to you, this is an amazing time together.